Nailsworth is a hub for some great climbs north of Bristol. From the centre you can take The Ladder up on to Minchinhampton Common, which opens no end of hilly options for your return journey. But to the south-west is Horsley Hill, which formed part of the 2014 Tour Of Britain route. If Horsley is on your route and you fancy a break in Nailsworth, you’ll find a fair few options for a coffee stop. On Sunday, Louis and me dropped down the A46 from the Chavenage/Tetbury turn and stumbled across Café 28… not sure if that’s its real name, but it didn’t have any other name on the hoarding, just a simple brass ‘28’. The café is above the town centre, on the right going the A46, opposite the Nailsworth war memorial and just past the turning for Horsley Hill. 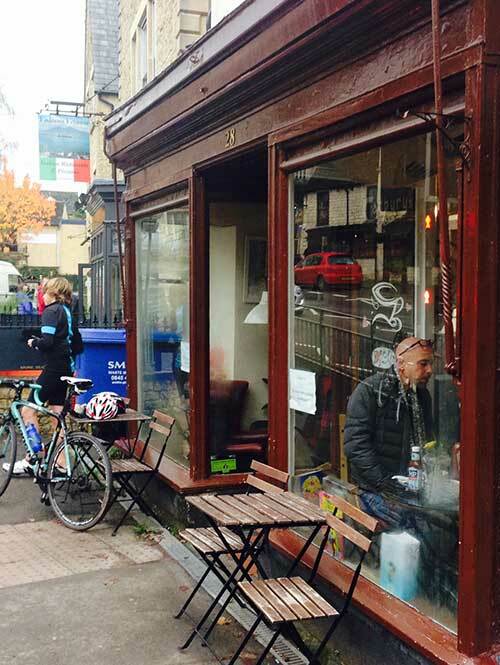 The café has a couple of tables outside, which is a massive tick in the box for many cyclists looking to rest their legs while keeping an eye on their bikes. The coffee was good, but they were a little short on cakes and flapjacks, but rustled up a very nice tea cake instead. We’ll give it 8 out 10 for being a really pleasant café… just need to sort out the cake options.